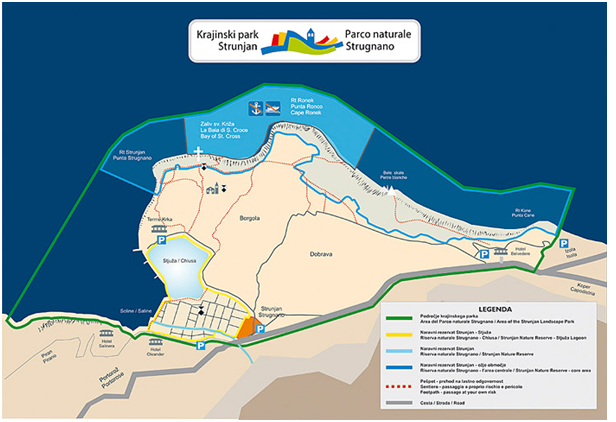 The goals of the pilot project were to: contribute to sustainable development of the area (Strunjan Landscape Park, situated on the Slovenian coast in the Piran and Izola municipalities); test MSP on local scale; contribute to reduce pressures on natural resources, environment, landscape quality and cultural heritage of the area; harmonise marine and land uses and contribute to eliminate conflicts between different uses at sea and on land; raise the quality of landscape and architecture design of the area; increase public opinion awareness on spatial planning and development issues. The pilot project was implemented through the following steps: (i) data collection and preparation of expert meetings, (ii) public presentation of collected data, expert meetings and SWOT workshop with stakeholders, (iii) preparation of spatial planning proposals and spatial arrangement concepts for selected areas, (iv) public discussion on the achieved results (in particular the pilot plan). The project SHAPE “Shaping an Holistic Approach to Protect the Adriatic Environment between coast and sea” aimed at the development of a multilevel and cross-sector governance system, based on a holistic approach and an integrated management of natural resources, risk’s prevention and conflicts resolution among uses and users of the Adriatic coast and sea. Within this overall goal project activities promoted the application in the Adriatic region of the Protocol on Integrated Coastal Zone Management in the Mediterranean Sea and the EC proposed Directive establishing a framework for MSP and ICZM. The project developed pilot actions at the local level on MSP possibly including the analysis of sea – land interactions, as the one developed for the Strunjan area in Slovenia. Shape started in May 2011 and was concluded at the beginning of 2014. The Strunjan pilot plan was prepared respecting municipal and national plans in force. In the planning process all relevant authorities, responsible for specific planning issues were consulted (see “Public Participation” section). The coastal landscape and architecture design proposals elaborated within SHAPE have been used to develop detailed projects for: (i) a small fishing port and (ii) a system of footpaths in the Strunjan Landscape Park. The fishing port has been built with the support of the European Fisheries Fund (EFF); the opening ceremony was held on 11th March 2016, with the participation of EU commissioner Karmenu Vella. The system of footpaths and related facilities (e.g. belvedere plateaus) in the Strunjan Landscape Park were also realised. The proper integrated MSP process foreseen by the SHAPE pilot plan has not begun yet. The pilot plan focuses on the area of the Strunjan Landscape Park, situated on the Slovenian coast in the Piran and Izola municipalities; it is a protected area, covering land and marine surfaces. The area is one of the most developed tourist areas in Slovenia, characterised by exceptional landscape and nature assets. The area faces pressures, such as tourism (high number of visitors in summer) and the related traffic, recreational vessels, fishery, mariculture, etc. There are conflicts in sea uses, such as in the case of fishing reserve, mariculture and marine transport. 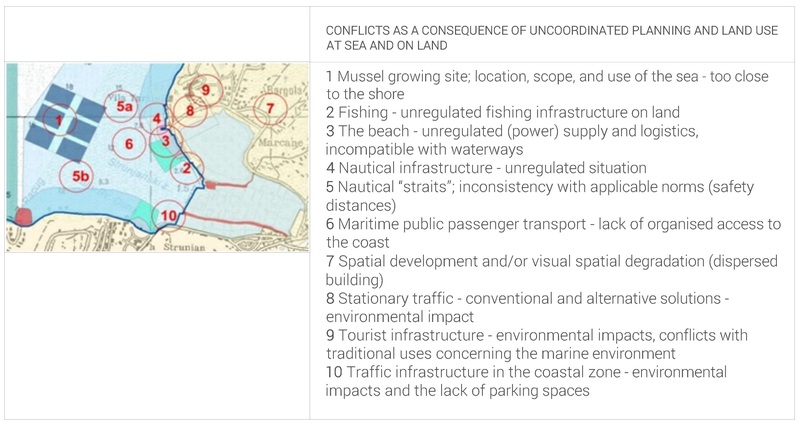 The conflicts are present also in relation to marine-land uses. The pilot plan was developed within the SHAPE project funded by the Cross-Border Cooperation Programme “Adriatic IPA 2007-2013”. sensitise public opinion on spatial planning/development issues. In addition to that traffic scheme (roads, public transport lines, bus stops, rent-a-bike points, car parks) of the area was defined. Recommendations on spatial planning and detailed spatial planning in the Strunjan area have been proposed. As a pilot MSP plan, Strategic Environmental Assessment was not applied.